5g or 7ml 의 시료만으로 Compounding 시험이 가능 (Batch mixing 및 Die를 통한 압출의 2가지 혼련 기능) 하며 Haake MiniLab 에 비교하여 훨씬 저렴한 가격 으로 제공 됩니다. The MiniLab micro rheology compounder combines real compounding and real rheological measurements with smallest amounts of materials (5g). This is of interest in R&D applications for new polymer development, nano-composite processing, and testing of expensive additives, i.e. pharmaceutical drugs and material studies. The MiniLab compounder can be equipped with conical co and counter rotating screws. Continuous viscosity measurements in the back flow channel up to 450° C. Digital and graphic data on a large LCD display or full control, data acquisition and evaluation with MS-Windows software. MiniLab System은 고가의 sample 또는 아주 적은 양의 측정 물질 약 5g 을 사용하여 연속적인 유변학적 성질의 측정과 함께 실제 compounding을 위한 장치를 겸비한 소형의 장비임. 본 기기는 새로운 기능성 Polymer 및 값비싼 specialty chemicals 및 첨가제의 개발과 관련 가공성의 연구를 위해서 제작. The MiniJet is a piston injection moulding machine and provides efficient sample preparation for testing mechanical and measuring rheological properties. A variety of different sample specimen forms is commonly required to perform thorough mechanical testing. These specimens can be produced using an injection moulding machine, cut manually from pressed sample plates, or created manually using some type of specific sample test device. The need to produce various sample forms coupled with the common reality of limited material quantities can often create great difficulty in a product's development. 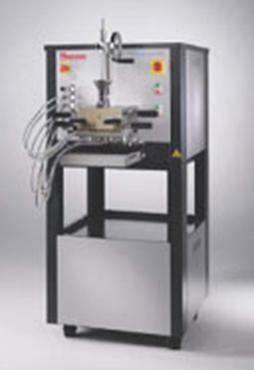 The HAAKE PolyLab OS is a modular torque rheometer platform for process engineering applications. The "OS" stands for the fundamental platform concept - that of Open System, allowing a number of standardised sensors and systems to be connected to if for otical, viscosity, and spectroscopy measurements. The new HAAKE PolyLab Open System (OS) is an innovative torque rheometer platform designed to optimize process engineering applications. Data for melt characteristics, dynamic viscosity under shear load and the effectiveness of additives, heat and shear stability are readily attainable with his system. The modular HAAKE PolyLab can be quickly and easily adapted to the requirements o a specific application. This is enabled by a standardised CAN Open Bus for internal communication and a USB interface for connection to a PC. Polymers - Processing related data such as melt characteristics, the effects of additives, temperature and shear stability as well as dynamic viscosity during shear are of great importance to the development of innovative polymers. Process simulation in the form of compounding and extrusion of rods, profiles or films combined with rheological or visual measurements, assists in optimising procedural parameters to create samples for testing. These samples can also be used to conduct checks on incoming and outgoing goods for viscosity, dispersion or plastifying characteristics. Rubber - The impact of carbon black on the cross-linking characteristics of a rubber compound and the dispersion, vulcanisation and flow properties of rubber are key to product quality in the rubber industry. Optimising the end product mixing times is important to ensure efficient use of production plants, and also to successfully launch competitive products into the market. Ceramics - Rheological measurement data relating to dispersability, ability to withstand injection moulding and flow characteristics of ceramic injection moulding compounds and pastes provide the ceramics industry with information to optimise products. 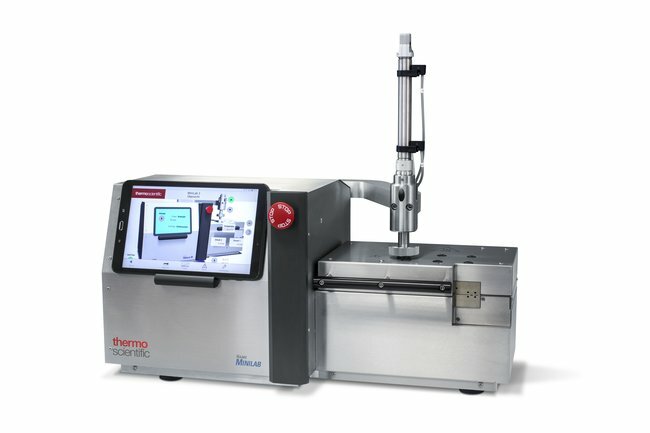 QC 및 R&D 작업에 사용 가능한 경제적인 Torque Rheometer. 적용이 가능한 착탈식 모듈 방식으로 다양한 Lab Scale Single/Conical Twin Screw Extruder 및 믹서 등이 제공된다. More IQ for your QC - benefit from the difference! 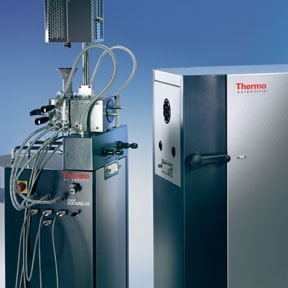 The new Thermo Scientific Rheomex PTW 24 MC (Modular Compounder) is a modular twin-screw extruder module for the lab extruder and mixer platform HAAKE PolyLab OS. Twin-screw lab extruders have a proven record in continuous com- pounding with feed-dosing of different additives (liquid or solid) along the extruder barrel. 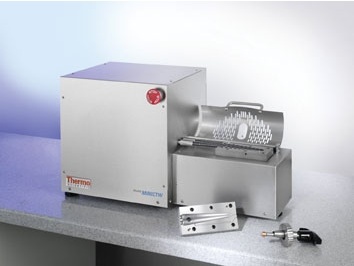 The combination of a twin-screw extruder unit with additional sensors offers the ability to measure material properties of the melt during processing. High shear 에서도 Torque 의 흔들림이 전혀 없는 Round feeding section 이 장착된 500C 까지 heating 이 가능한 120cc및 625cc 챔버가 장착된 두가지 모델이 있으며 열경화성 및 열가소성 모델이 선택 가능. HAAKE PolyLab 압출기 및 OQT를 이용한 Fish-Eyes 및 Black-Spots의 Differentiation 에 사용되는 Built-in CCD 카메라와 Image Analysis 소프트웨어를 사용한 Film QC장치.